Egberi papa 1 of Bayelsa and CEO of DM Records, Timaya, is set to drop his 5th studio album titled “Epiphany ‘ on the 25th of this month. 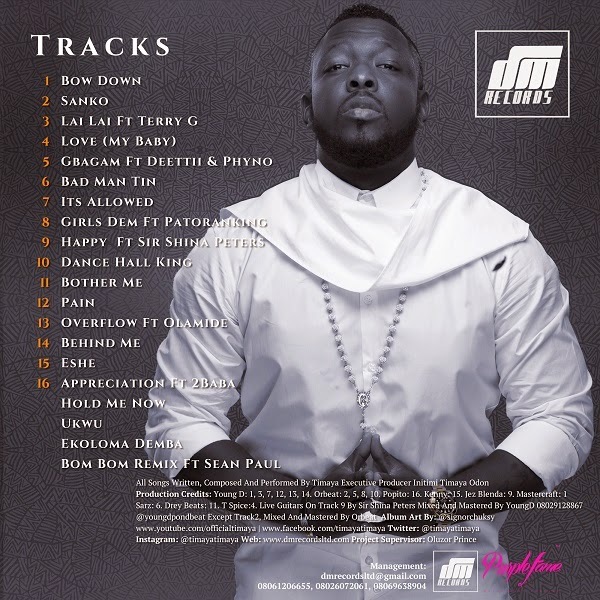 The album has 16 tracks and 4 bonus tracks including hit singles like Hold Me Now , Ukwu , Ekoloma Demba and Bom Bom Remix Featuring Sean Paul. Epiphany has artists like olamide ,2baba ,Terry G ,Sir Shina Peters , Phyno , Patoranking and more on the featured list, producers like Young D , Drey Beatz , Popito , Masterkraft ,Tspize and more with production credits.